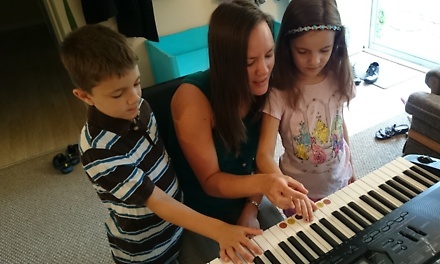 My target clientele is moms, or any other women, who would like to learn to play the piano in a relaxed, no-pressure environment, so that they are able to then teach others or simply…be able to play their favorite songs for themselves and their loved ones. Students should bring to their lesson the name of three songs they wish they could play. If the student decides to continue with more lessons they will need to purchase the Bastien Piano books at a total cost of $20 for four books. Many moms who sign their kids up for piano lessons say that they wish that they could have had the opportunity to take lessons when they were young. I would like to encourage them to take advantage of the opportunity that they have now. Watching the students progress to the point where they can play their favorite songs with pure joy. New customers only. Reservation required. Limit 1 per person, may buy 1 additional as a gift.